Many Sonoma County gardeners like Swiss chard because it'll grow in both cool and warm weather. This ability to grow through the summer sets it apart from most greens, and you should put it at the top of your planting list for this month! Chard has the added advantage of being able to withstand below-freezing winter weather. Chard is actually a bottomless beet. It's in the same family as beets, but chard doesn't develop a root like beets. In the large, fleshy stalks and broad, crisp leaves, there are plenty of minerals and vitamins, just like the highly nutritious beet tops. Plant chard in rows about 15 inches wide, scattering the seeds an inch or so apart. After thinning, the plants will be 6- 10 inches apart. Harvest the first plants when they are about 6 inches high, and cut the entire plant an inch above the ground. In a short time, the chard leaves will grow again. Harvest only a few feet of the row at a time, so by the time you cut your way to the taller plants at the end of the row, the plants you harvested first are ready to cut back again. This way, the wide row of chard will keep producing all the way into fall and early winter. If you'd prefer to set out little starts, plant them at 6 to 10 inches apart. If you really enjoy chard, make 2 plantings: one in early spring and the other in late summer. Chard comes in quite a few colorful colors: red, green, yellow, and even orange! The healthiest and best-tasting greens are those that grow quickly. The important contributors to rapid growth are a steady moisture supply and a fertile soil, one rich with decomposed organic matter or compost. Make it a point to regularly work plenty of organic matter into the top 6-8 inches of soil. Organic matter in the soil helps it to act like a sponge, retaining moisture, adding lots of nutrients, and helps to improve poorly draining soil. The best time to add fertilizer is on the day you plant. A balanced fertilizer such as 5-10-10 works well. Follow the directions for the proper amount to use per square feet. No additional fertilizer should be needed during the growing season. Chard is delicious sautéed with garlic or shallots and topped with a splash of balsamic vinegar. It also makes a great savory tart filling, either alone or combined with leeks. The midribs may be cooked separately in bite-sized pieces, an especially attractive dish when made with several brightly colored varieties. 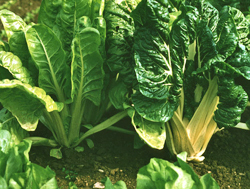 Chard starts are available now in many hardware and garden centers, and seed widely available as well.